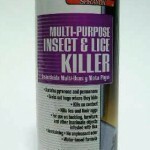 PRODUCT DESCRIPTION: Multi-Purpose Insect and Lice Killer protects against ants, cockroaches and houseflies for up to 12 weeks. It is a water-based, non-staining formula. Sprayed indoors, it kills ants, bedbugs, carpet beetles, centipedes, cockroaches, crickets, firebrats, fleas, millipedes, palmetto bugs, pill bugs, scorpions, silverfish, sow bugs, spiders, ticks (including adults and larvae of those which may cause Lyme disease, and water bugs, as well as flying insects such as bees, blackflies, blowflies, cluster flies, fleas, fruit flies, gnats, hornets, houseflies, lice, mosquitoes, skipper flies, small flying moths, and wasps. Use it outdoors to kill ants, centipedes, cockroaches (including Asian cockroaches), crickets, mole crickets and silverfish, and flies, gnats, hornets, mosquitoes, small flying moths, yellow jackets and wasps. RECOMMENDED USES: Ideal for garbage rooms, lavatories, floor drains entries and vestibules, offices, locker rooms, machine rooms, boiler rooms, garages, mop closets and storage. Safe for use on bedding, clothing and furniture. COVERAGE: Each can will cover up to 1,000 sq/ft of surface area. For small jobs and spot treating, this formulation is well suited for the job. For large jobs, consider the liquid option. Great service! Order received promptly, Extremely lengthy directions, but done the job very well. Body Lice problem gone for good. Still don't have slightest idea where they cam from. Turned up 4 months after hurricanes Irma and Maria came in from Caribbean islands where they are very prominent.